The traditional needles used for quilting are called betweens and are generally smaller and stronger than normal sewing needles. They have a very small eye which prevents any extra bump at the head of the needles when you are pulling though the thread. The betweens needle is slightly thicker than other needles, giving it added strength for moving through a quilt’s multiple layers. The come in sizes 9, 10, 11 and 12, with size 9 being the largest and size 12 being the smallest. The extra strength and fineness of the quilting needle means you can easily sew through a number of layers without it bending or breaking. This aspect is also fantastic as it helps reduce puckering and it also punches through the fabric with less “bump”. Hand quilting needles are very strong and fine as they allow the quilter to make very small stitches and go in any direction they want. 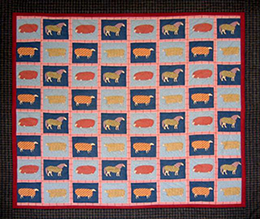 This process is a lot slower than machine quilting, however overall this can give the quilt a beautiful and satisfying home-made appearance.